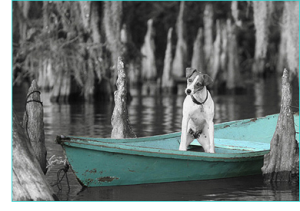 “The story of Swamp Dog is a sweet and simple one. Shortly after Hurricane Katrina, she was found on an old gravel road between the banks of Bayou Lafourche and a sugar cane field in a small South Louisiana village called Napoleonville. No one knows for sure if she was a victim of the Great Hurricane, or simply a victim of sad circumstances, the kind that find so many strays abandoned and alone. Her rescuer, a good man from the swamp, took her home and made her whole again. He named her Shiloh, unaware of the journey he would soon take with her, a journey from her humble beginnings as his little stray hound of questionable heritage and pedigree into the world of Swamp Dog. To see the rest of the Swamp Dog & Friends Story, visit their website by clicking here. Stop by The Arbor Gate to see the artwork available!